Kristen Organ comes from a very creative family. At an early age, Kristen became her Mom’s test subject for craft projects that her Mom intended to do with other children in the neighborhood. Through that and watching her Mom wittle and create crafts, Kristen fell in love with creating things. Her love of working with tools, creating three dimensional objects and following in her older sisters footsteps led her to study metals in high school. After graduating from high school, she headed off to college to continue her studies. 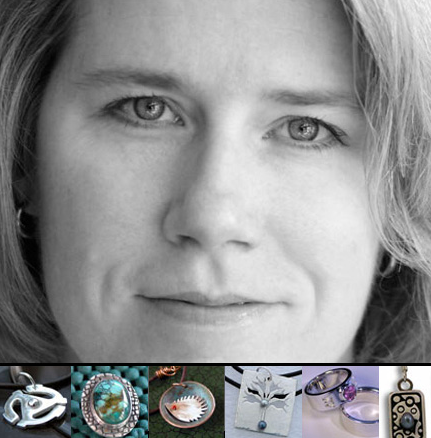 She received a BFA from Grand Valley State University and a MFA from Indiana State University in Metalsmithing. After working and learning from others within different “metals’ ” disciplines, Kristen decided to venture out on her own to create her own company, vision and works. Kristen named her company Hickyjig. The word hickyjig was coined in graduate school. She was asked to name all her pieces and when she could not figure out what to call one piece, a friend said “It’s a hickyjig.” Hickyjig it was for the piece and later the company. The word Hickyjig embodies the essence of the company and the objects created. Kristen believes in spontaneous and organic development with an emphasis on diverse materials to enhance form, texture and aesthetics.